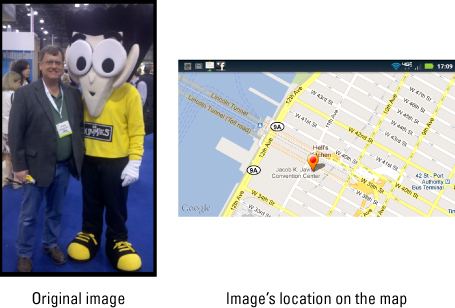 In addition to snapping a picture, the Droid Bionic saves the location where you took the picture. This information is obtained from the phone’s GPS, the same tool used to find your location on a map. In fact, you can use the information saved with a picture to see exactly where the picture was taken. For example, this figure shows both the original image and the location where that image was taken. The location information was saved by the phone’s GPS technology and is available as part of the picture’s data. View the image in the Gallery. Choose More and then Map. Not every image has location information. In some cases, the Droid Bionic cannot read the GPS to store the information. When this happens, location information is unavailable. Add another item to the list of amazing things the Droid Bionic can do: Print a picture. As long as you’ve set up and configured a printer for your Droid Bionic, you can print any image stored in the Gallery. View the image you want to print. Press the Menu soft button and choose More and then Print. Choose the printing method, such as Print with MOTOPRINT. Touch the Print button to print the image. In mere moments, the phone uploads the image to the printer, et voilà, you have a hard copy of your digital image. The picture comes spewing forth from the printer.